One of the most common characteristics of contracting businesses like HVAC is that the work is seasonal. Your techs work long hours during the summer and winter on-season, but the workload all but disappears during the off-season. Unfortunately, no matter what’s happening with your customer calls, bills still come in, and employees still need to be paid. Most techs have come to view this as just part of the job. It takes several years to become an HVAC pro, and the pay gets better with more experience, so the seasoned techs aren’t bothered by the seasonal flow. But, the down time does provide an opportunity for the best techs to consider their options. Established companies understand this and will do whatever it takes to keep them around. And you should try to keep yours. An experienced and dedicated tech will help your overall sales, can help train other techs to increase sales, and can help secure steady customers and referrals with their excellent customer service. Your challenge in keeping good techs in a cyclical business comes down to understanding both what your customers need and what your employees need. 1.) The more you understand your customers’ needs, the more opportunities you’ll find for obtaining their off-season business. 2.) The more you involve your best techs in your overall plan and strategy, the more invested they’ll be in your company. The off-season shouldn’t be something that you simply survive. You should plan year round as to how you’ll handle the reduced workload, and how you’ll keep your best techs engaged during that time. Your techs are the face of the company to your customers. Design your business so that your good techs want to stay and help you make it through the slow times. And update your customer database so you can use it to your advantage during the slump. The easy answer is to provide value to both customers and employees. 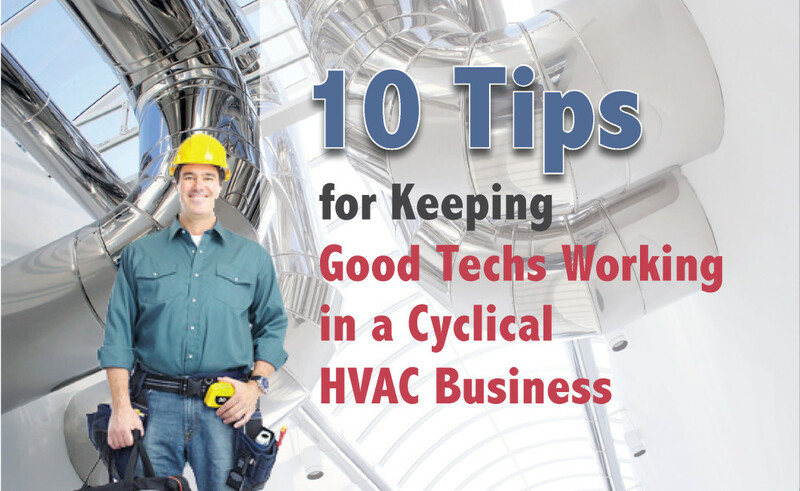 Take a look at these 10 tips for keeping good techs in this cyclical HVAC business on how to make that happen.